Coal, steam, toots of trains, the rattle of the tracks – these are the sounds, smells and sights of the Great British Railway. All bring a reminiscent warmth and sense of excitement to both young and old. Here in Norfolk we are blessed with some of the UK’s finest railway lines and stations, with North Norfolk in particular boasting a truly wonderful attraction. 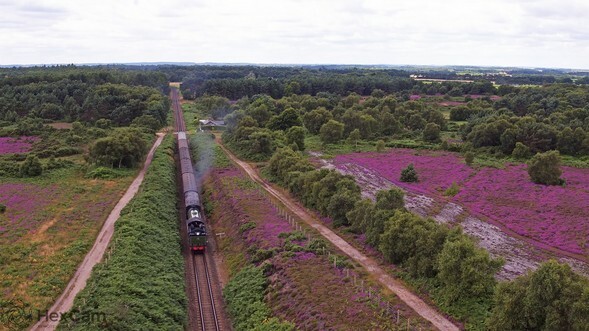 It is no surprise that train spotters and enthusiasts from around the country make their way to North Norfolk each year to catch a glimpse of uniquely beautiful railway lines, steam locomotives and coastal scenery. The North Norfolk Railway is a preserved steam railway connecting coastal towns from Sheringham to Holt. Blessed with stunning scenery and views of the sea, the tracks wind and weave through the beautiful landscape of which North Norfolk has become so renowned. Operating both diesel and steam trains, visitors can take advantage of regular journeys and numerous events throughout the year, as well as education days, and meals aboard The North Norfolkman. The Poppy Line is particularly popular amongst locals and visitors to the area. The five and a half mile journey features full-size mainline steam engines, vintage carriages, three delightful Victorian stations, railway museum and plenty more to see and do along the way. For young families, ‘A Day out With Thomas’ is always a hit – meet Thomas the Tank Engine and his friends who are waiting for you on the tracks! This summer, from the 2nd to 4th September, the annual Grand Steam Gala takes places showcasing a mix of visiting and home locomotives – one of the best railway experiences in the country (some will tell you!). Steam trains draw in people from every corner of the UK over the course of three days, with standers by ready and waiting with their cameras hoping to catch a glimpse of magnificent locomotives.